If you have an aggressive dog—or a dog who has the potential to be aggressive—you may have to consider using a muzzle. That being said, a lot of people don’t understand when it’s appropriate to use a muzzle or what type of muzzle is the safest choice for their dog. For that reason, I want to talk about different types of muzzles, the pros and cons of using muzzles, and how to pick a muzzle that will keep both you and your dog safe. To begin, I want to discuss one of the biggest mistakes that people make when it comes to muzzles. That mistake is that people think using a muzzle will train a dog not to be aggressive. This is certainly not the case. A muzzle is not a training device. It should only act as a safety device or safety net! It is a great tool that you can use while you are training your dog. But, it does not really deal with the cause of the problem. So, if you start using a muzzle, you also need to do some actual dog training to help resolve your dog’s aggressive tendencies. Stressed dogs are NOT happy dog’s. Another misconception is that people think it’s OK to bring a very aggressive dog who’s showing serious signs of aggression out in public places (park, cafe, etc.) as long as the dog wears a muzzle. This isn’t fair to your dog or other dogs and dog owners. Sure, your dog may not be able to bite with a muzzle on, but he’s likely going to still be stressed out. This stress can attract unwanted attention from other dogs and comments from other owners! A muzzle isn’t going to correct your dog’s aggressive tendencies. You still need to implement training to see positive changes and results. Until your dog begins making progress with aggression training, it’s not fair to put a muzzle on him and take him out to places where he might be anxious and/or upset other dogs. Which Is the Right Muzzle for Your Dog? As you can imagine, there are many different types of muzzles. However, you can group the majority of them into two groups. First, there are what we call basket muzzles. These muzzles look a bit like a woven basket and are designed to allow dogs to open their mouths a bit, breath, drink, and even eat without any problems. The other type of muzzle is what I call a Sausage Sleeve Muzzle. It’s a funny name, but it reminds me of the way a sausage skin contains meat. The problem with this muzzle is that it’s tight and is very fitted to the dog’s muzzle. For this reason, dogs who wear them struggle to drink, can’t eat, and have a hard time breathing. A sausage muzzle wraps around a dog’s nose like a sleeve as in the picture below. This forces the mouth closed and prevents the dog from opening his mouth and breathing properly. This type of muzzle is very effective at keeping a dog’s mouth closed so he can’t bite. For instance, if it’s hot outside, your dog needs to be able to pant to stay cool. With the sausage muzzle on, a dog can’t pant, which can lead him to overheat, get really sick, or even die. It’s also true that most dogs need to breathe a lot when outside because, by default, they are being exercised, running, and are excited…so getting lots of oxygen in is super important! On top of it all, the dog wearing the muzzle might be stressed (hence the need for the muzzle), and the contact stress can lead to more aggression, putting your dog in a vicious aggression circle. Despite the fact that I don’t recommend sausage muzzles for when a dog is being exercised outside, there is a place for them. They are very secure and safe, which makes them ideal for some people like veterinarians. When a vet uses this type of muzzle, he or she is often indoors in an air-conditioned facility, and the muzzle is only kept on for a short time. 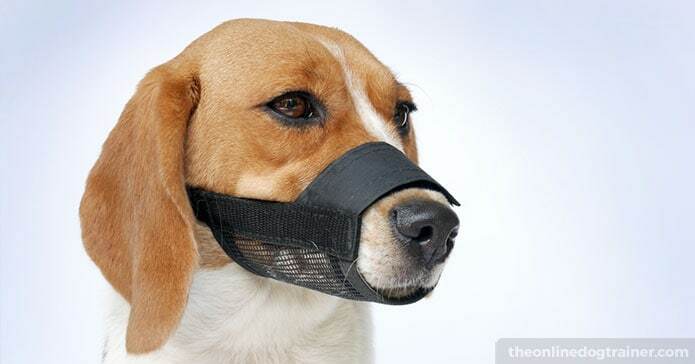 In this type of situation, using a sausage muzzle is safe for both the human and the dog. So, as you can see, there are exceptions to the rules. If you see a vet or other similar animal care provider using one, I wouldn’t worry too much. Finally, there is one more type of device that looks like a muzzle that I want to mention, even though it’s not actually a muzzle. The reason: I see a lot of people often confuse it with a muzzle so I wanted to clarify its purpose. It fits over a dog’s nose and uses pressure to gently prevent dogs from pulling on the leash. That being said, dogs can still bite while wearing a Halti, so it shouldn’t be used for aggressive dogs. A Halti head collar is NOT a muzzle! If you’ve made the decision that you need to use a muzzle, you might be wondering what type you should use—especially because some are dangerous in certain situations like the one I mentioned above. If you have an aggressive dog, the actual muzzle style I recommend is a specific brand of basket muzzle, known as a Baskerville muzzle. This type of muzzle is a basket-shaped device that goes on the front of the dog’s face. It’s open enough that it allows a dog’s jaw to open so he can breathe, drink, and even eat! This muzzle also has a number of safety features, which make it incredibly strong and secure. Best of all, they are wellsized and wellfitted so they are comfortable for dogs. I have used them for over a decade now, and they are absolutely brilliant. If you’re interested, here’s the link to the one I use! So far, we’ve covered common muzzle-using mistakes as well as what type of muzzle you should use. Now, I want to talk about when it’s appropriate to use a muzzle. You may have put a lot of time in at home working to get rid of your dog’s aggressive tendencies. And now, you may be ready to try taking your dog to the park or in a public place. Although you’ve put in the training, you might still worry about your dog biting. It’s like a safety net—it’s not that you expect to use it; however, it’s there on the off chance that you will. And that is how you should be viewing the muzzle. The next time that you should use a muzzle is when you have to put your aggressive dog in a situation that you cannot avoid, like going to the vet. Doing this will keep both you, your dog, and the person handling your dog safe so no accidents happen. Lastly, a muzzle is brilliant if you are the one that is very stressed and worried that your dog will bite someone. The reason is that dogs pick up on our energy. If your dog senses you are stressed, he will be more likely to feel stressed as well and bite. If you’re able to relax knowing a muzzle is on your dog, your dog will be able to relax, too. Before we finish up, it is important to point out that the size of the muzzle is very important. If it is too tight, it can rub on your dog’s nose, create sores, and put pressure around the face and push on the end of the dog’s nose. Improperly fitted muzzles can also block a dog’s vision or become unsecured when it is too loose. You need to make sure you get the right size muzzle. Here’s a quick video of me replacing a sausage muzzle with a Baskerville muzzle. Check out the fitting and how the dog has more room to open her mouth and breathe..
Oh, and in case you have trouble with getting your dog to wear a muzzle, I put together some tips that will hopefully make it easier for you. ➜ Access your FREE guide here. As I said earlier, a muzzle will not get rid of aggressive behavior. For that reason, you must work on training your dog to get rid of his aggressive tendencies. I know that the idea of training an aggressive dog might feel overwhelming to you. You may not even know where to begin, and that’s ok. I’m here to help! First, if you are really worried about your dog’s behavior outside, I recommend purchasing a Baskerville muzzle for your safety. Don’t forget to download my FREE guide on Tips for Training Your Dog to Wear a Muzzle, too! And while you are waiting for your muzzle to arrive, I suggest you check out my online training program and get started with the training —The Online Dog Trainer. In this program, I will teach you proven and effective methods that are essential for calming your dog down and helping him put an end to his aggressive behavior. Find out more about The Online Dog Trainer program here!